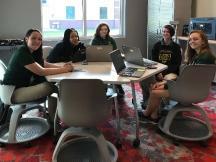 At the beginning of the school year, MCC&apos;s three CyberPatriot teams began meeting weekly to prepare for the competition by studying online safety, cyberethics, principles of cybersecurity, computer basics and virtualization. These teams successfully competed in the two qualification rounds during the fall semester. In January, the three teams participated in the state round with the goal of advancing to the semifinals. 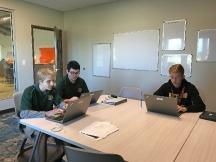 On February 1, the team of Luke Hermida, Peter Lannon, and Hunter Wittenburg competed in the semifinal round. The results will soon be available. We are proud of these students and all they have accomplished!